The Spring (vernal) equinox is upon us! Today, March 20th, both the Northern and Southern hemispheres will experience an equal amount of daylight. Equinoxes and solstices are opposite on either side of the equator. For those of us in the Northern Hemisphere, the March equinox marks the beginning of Spring, with daylight hours continuing to lengthen until the Summer solstice in June. For those South of the equator, it is the Fall (autumnal) equinox, which marks the start of Fall. The tilt — possibly caused by a massive object hitting Earth billions of years ago — means that for half the year, the North Pole is pointed toward the sun. For the other half of the year, the South Pole gets more light. 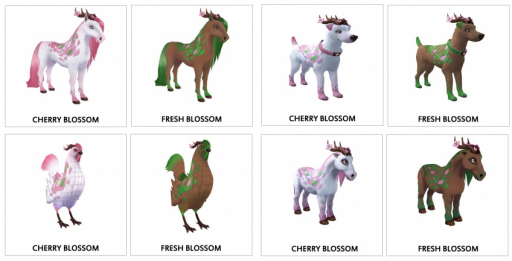 It’s what gives us seasons. Whatever the reason, I, for one, am happy to see warming temperatures, trees budding and flowers popping up from their Winter hiding spot under the soil. Today, also, marks a great day to a look back at some of the Spring Editions that Amaretto has created over the years. 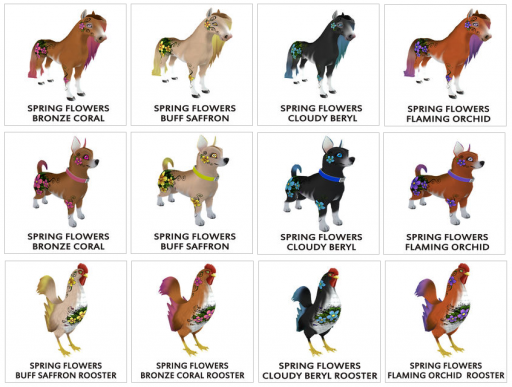 The 2015 Editions went a step further and introduced the Spring Flowers! 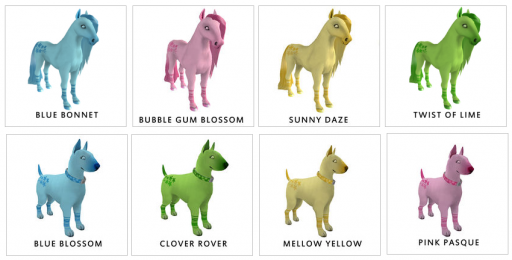 These gorgeous Coats/Breeds were the hidden surprise inside the 2015 Spring Editions. They DO have the ability to pass! 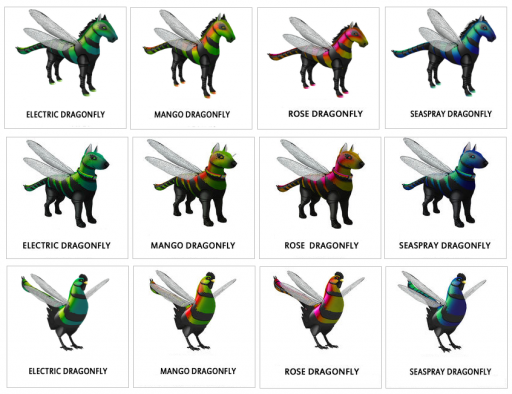 What a collection of beautiful breedables! Amaretto strives to keep things fresh and new, so, you never know what’s going to pop up next! Happy Friday Everyone!!! Hope everyone is having a good breeding day!! 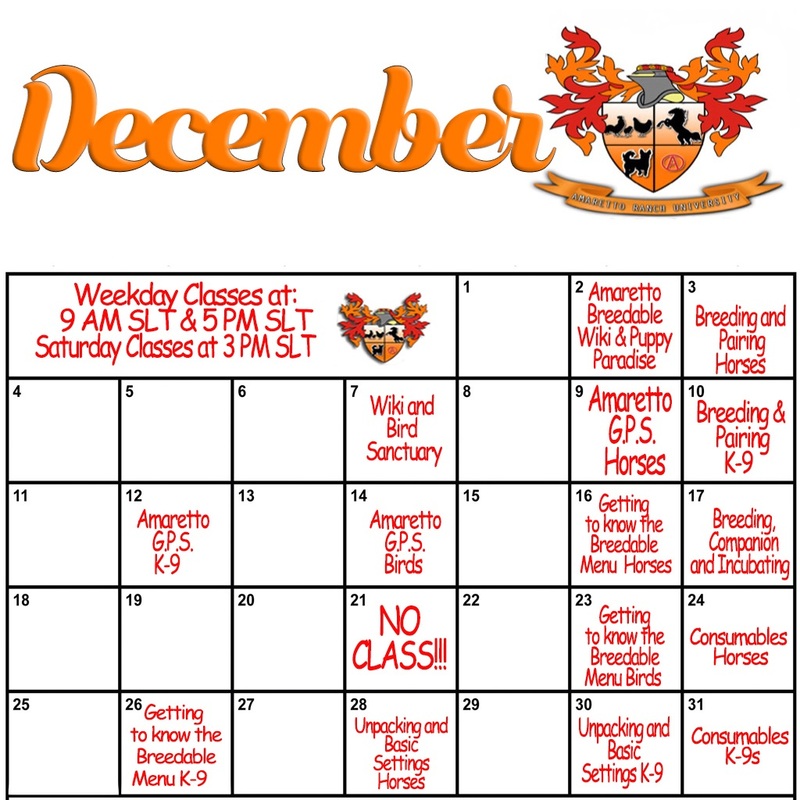 This week I’m going to tell you all about the December happenings at Amaretto. 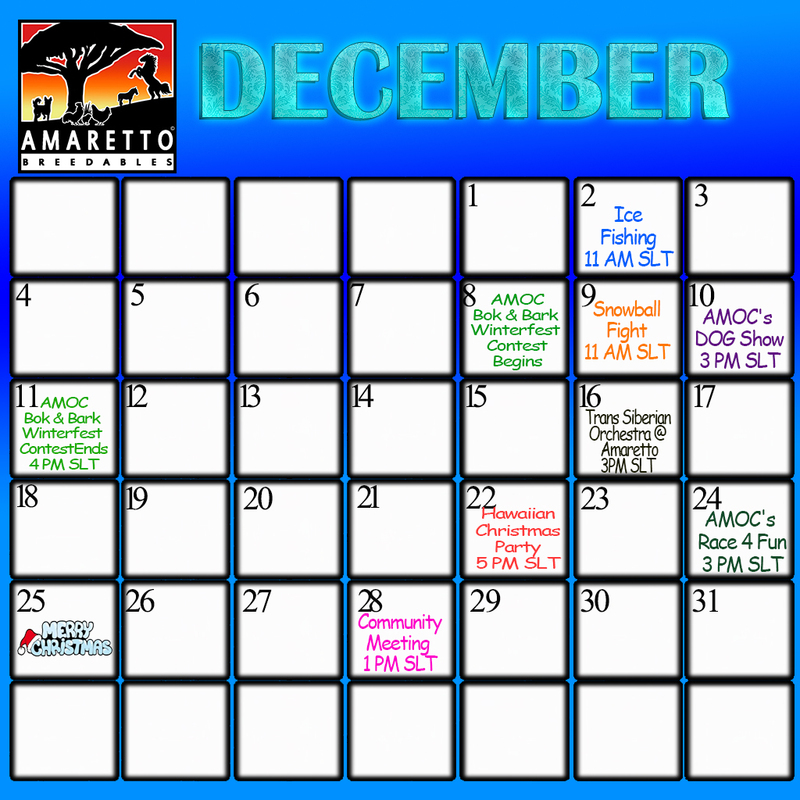 Amaretto has plenty of events and classes for December so don’t forget to attend. Dec 25 – Christmas Happy Holidays Amaretto Breeders!!! Dec is going to be packed with fun events so be sure to attend!!! Included are the ARU classes for December! Happy Birthday Everyone!!! Hope everyone is having a good breeding day! WOW!! What a Party!!!! Amaretto wants to thank each one of our Amaretto Breeders for making this 6th year a great year. Looking forward to many more with you all!!! 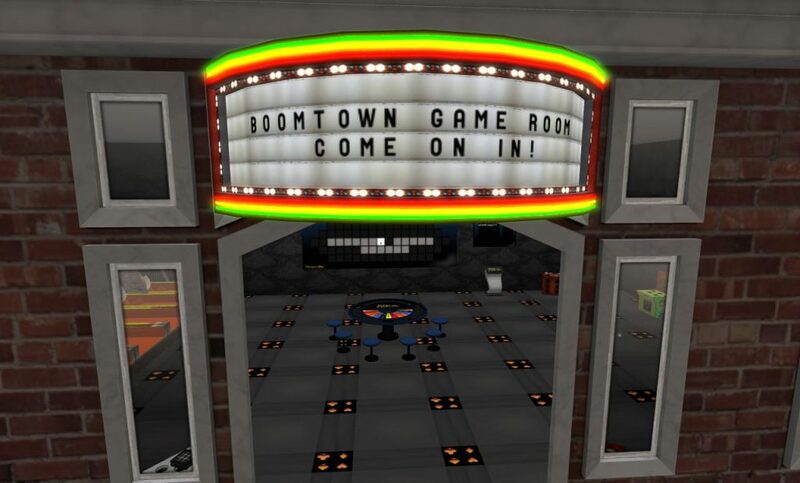 This week I would like to tell you what is happening in September beside the party and double haven points hehe!! September is going to be an exciting month with it starting off with our 6th Birthday Party hope you all had a blast! So you see September is jam packed with events so be sure you don’t miss out on any of them. Mark Your Calendars!!! 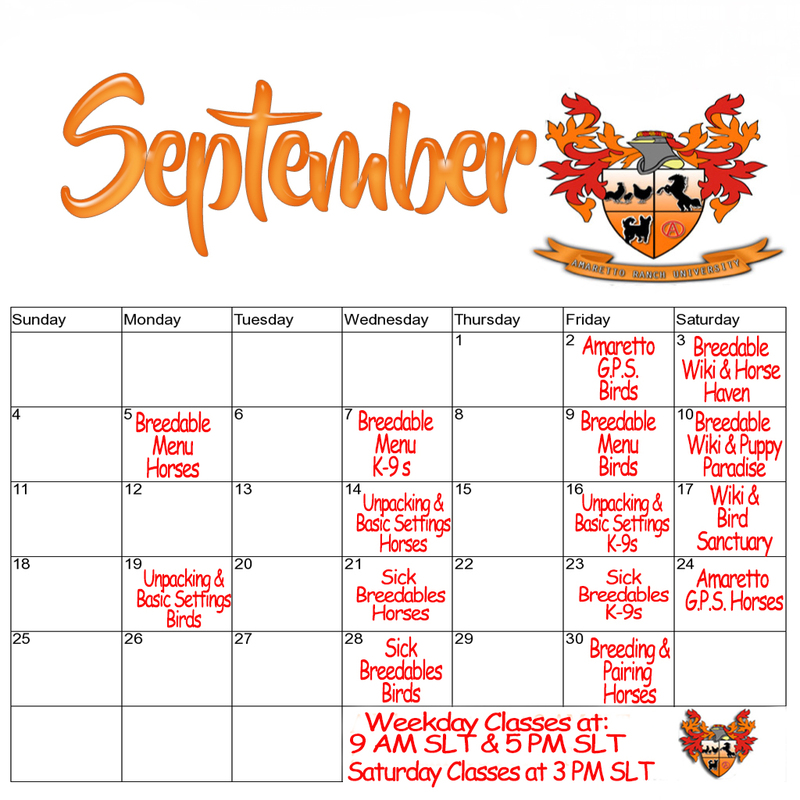 Please remember to attend the September classes at The Amaretto Ranch University. 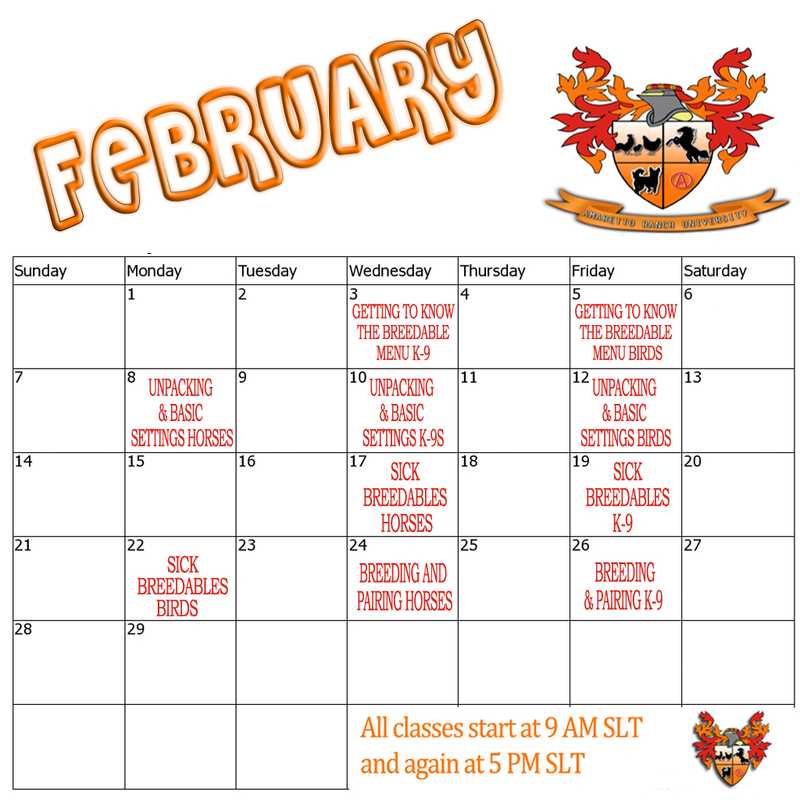 Amaretto has added classes on Saturday so you don’t miss out on classes. 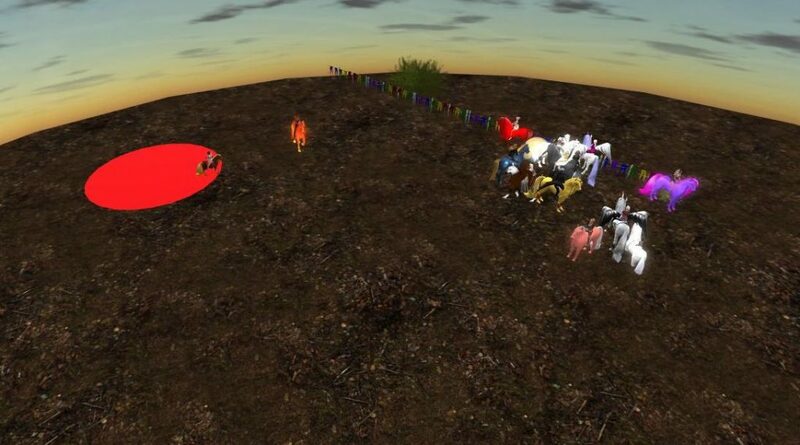 So please check the calendars as to when the classes are, the time for classes are at 9 am & 5 pm SLT, Saturday classes are at 3 pm SLT. 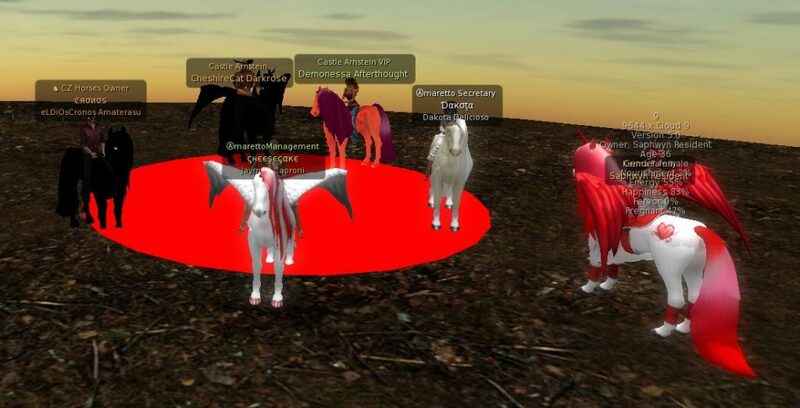 The classes are very informative, plus you can meet a lot of your fellow breeders. Looking forward to seeing you in class!!! 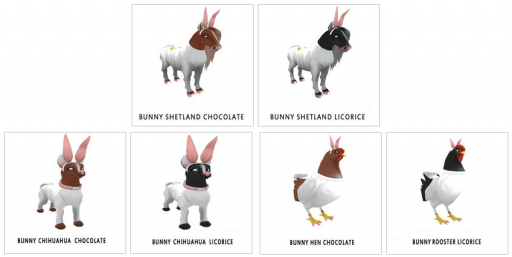 This week I would like to tell you all about my Amaretto Hay Day Event. Well to start Ava was captain of the blue team; Jaymee was captain of the red team which each picked breeders to be on their team. Let me tell you we had a good turnout there were horses everywhere. 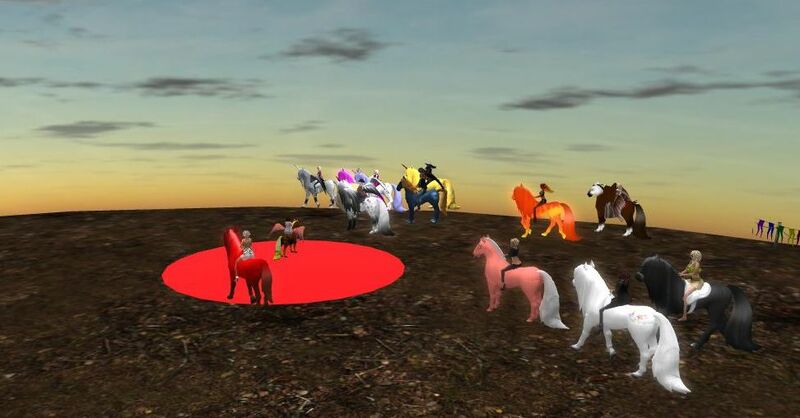 We all had a good time and the event was a success. Congrats to the blue team for winning the game!!! Let me tell you all the Amaretto Breeders that attended were winners! Amaretto gave each one a 2016 Independence Day Edition American Bald Eagle! That was exciting!! A fun game of Hay Day and then the great surprises! 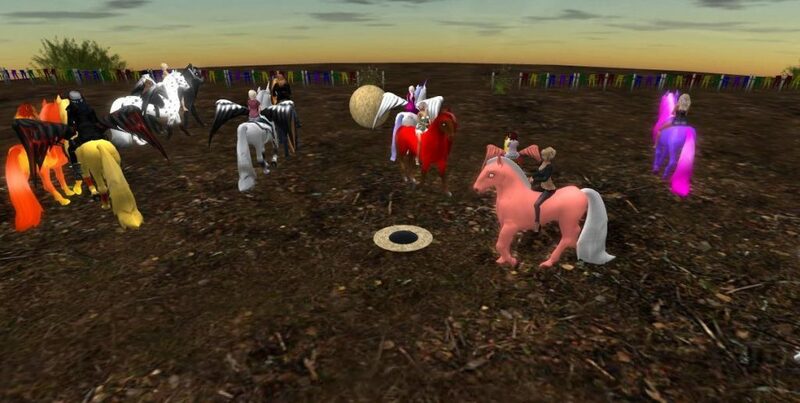 I am including some pictures of the Amaretto Hay Day Event. Don’t forget to go by an pick up you some of them 2016 Independence Day Edition American Bald Eagle they will be on sale until July 11,2016 these are on sale at any of the Amaretto Store . 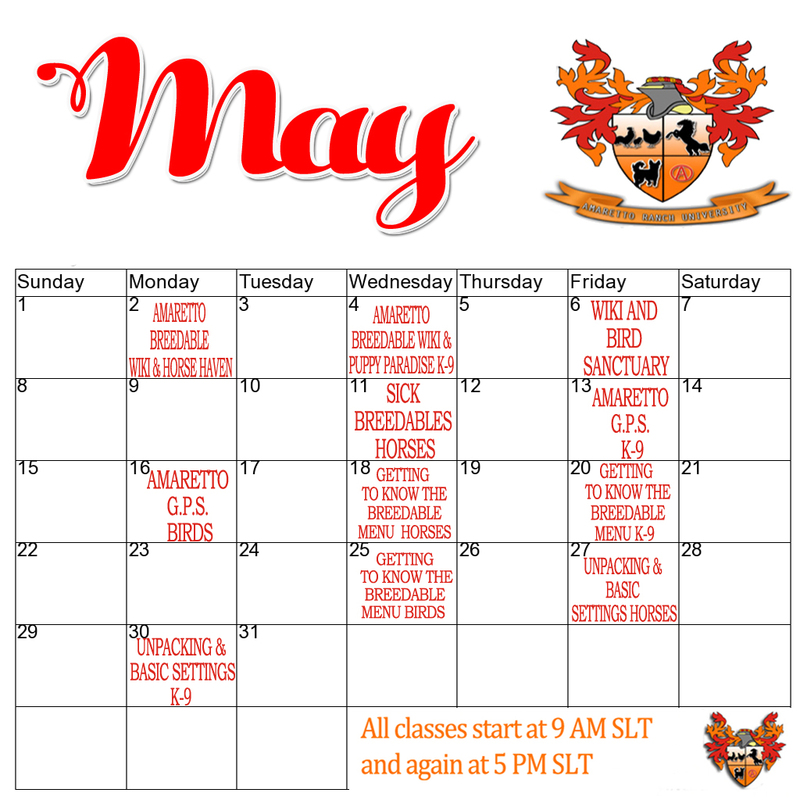 Check Out The May Calendars! Hey guys its another Terrific Tuesday here at Amaretto!! Can you believe it is May already?! Time flies when you’re having fun! 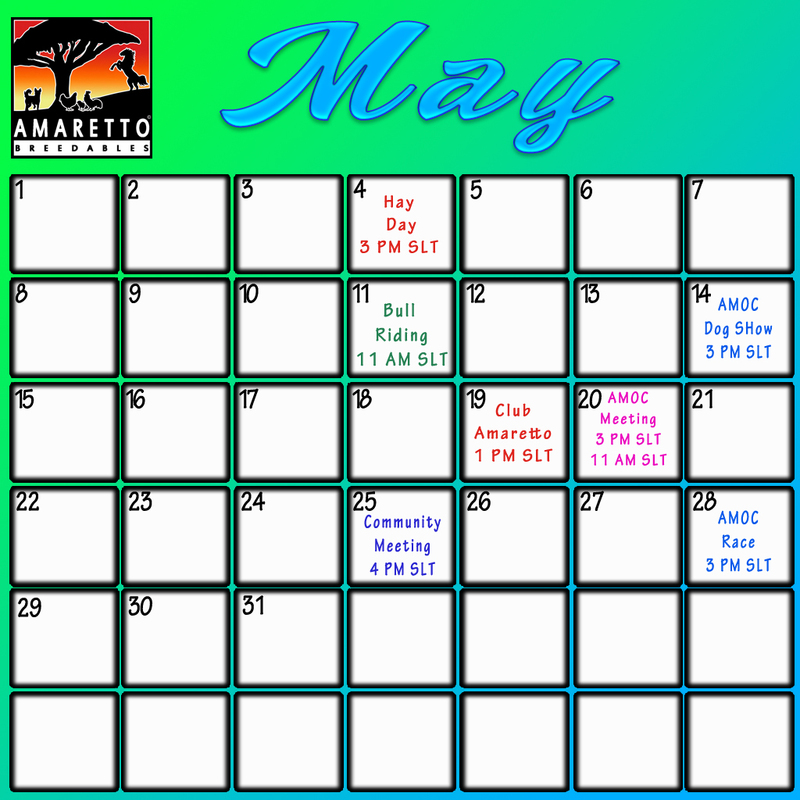 Speaking of fun… I wanted to take a few moments to draw everyone’s attention to the month of May Calendars and all the fun events Amaretto will be hosting this month!!! 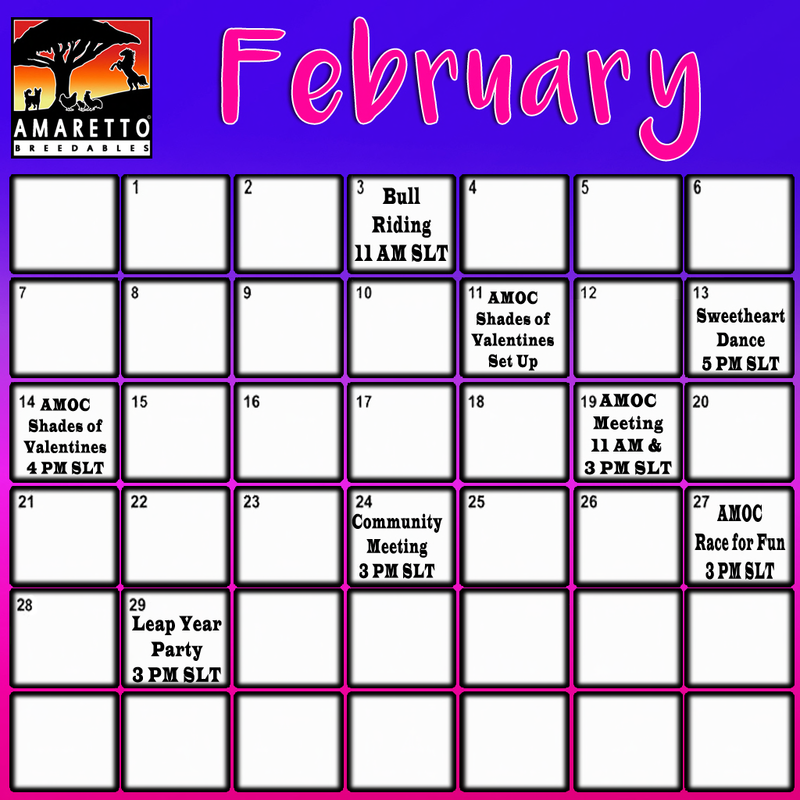 This month Amaretto has some awesome events planned for the community! Take a look! Also, be sure to get those Amaretto Ranch University classes in so that when the next graduation comes up you will have them completed! Check out this months ARU calendar below! 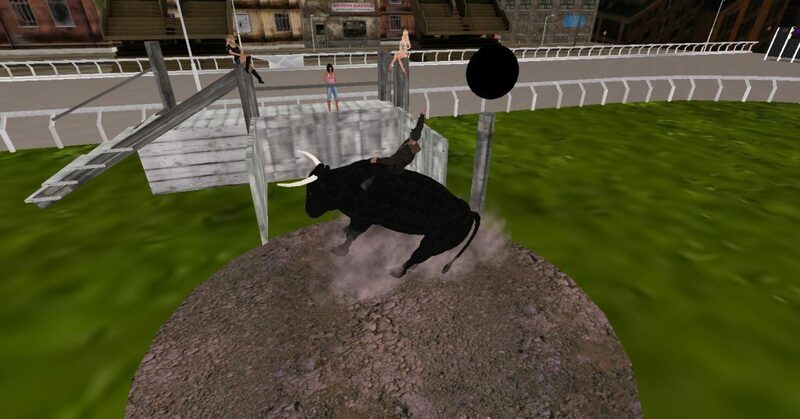 Today I wanted to tell you all about the Amaretto Bull Riding Event we had on Friday June 5. 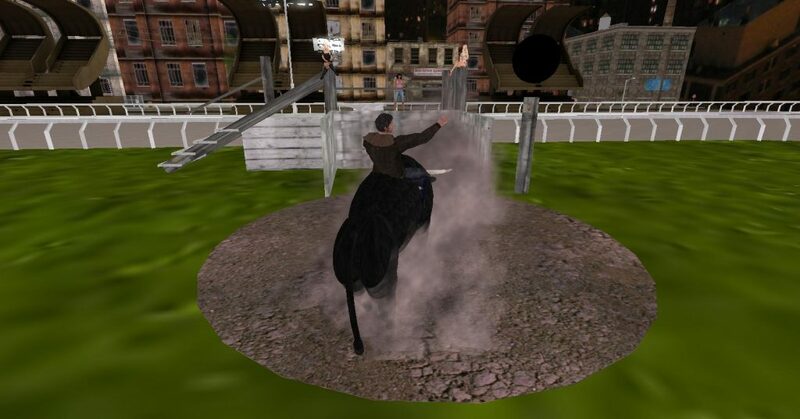 The event was a lot of fun and the breeders were trying their best to beat the highest score but Bart (the Bull) was being a little bit mean and was not letting anyone stay on long. Congratulations to the winners it was a fun time an good to see so many there! So, if you missed it this time be sure to catch the next one!! Today I wanted to tell you all about the Hay Day Event that was on Wednesday. Amaretto had 2 teams a Red Team and a Blue Team. Avalon was Captain of the Red Team and Dakota was Captain of the Blue Team. The Captain of each team chose there players. The Red Team won the game reaching 10 points before the Blue Team an it was a close game , Good going Red Team !! Amaretto sent everyone attended a 2015 Spring LE for a prize. Amaretto had a good turn out an all seemed to have a good time. So if you missed this one, you don’t want to miss the next one !!! Including some pictures of all the fun. 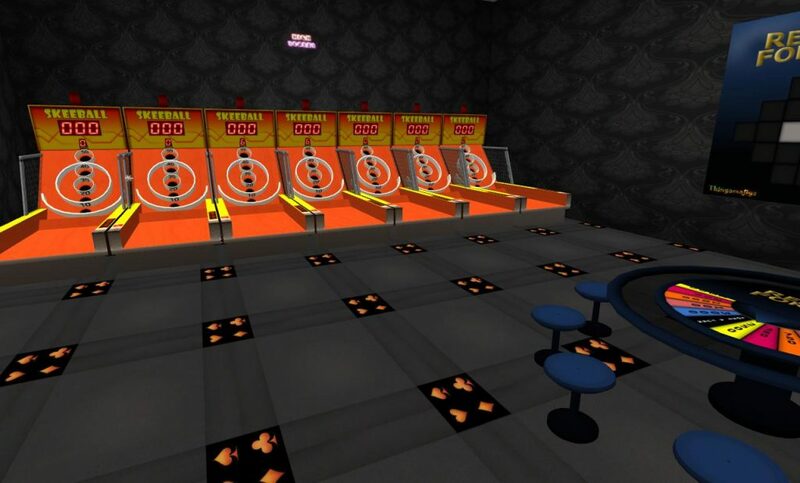 Just wanted to tell you about the Amaretto Game Event which was on Wednesday. 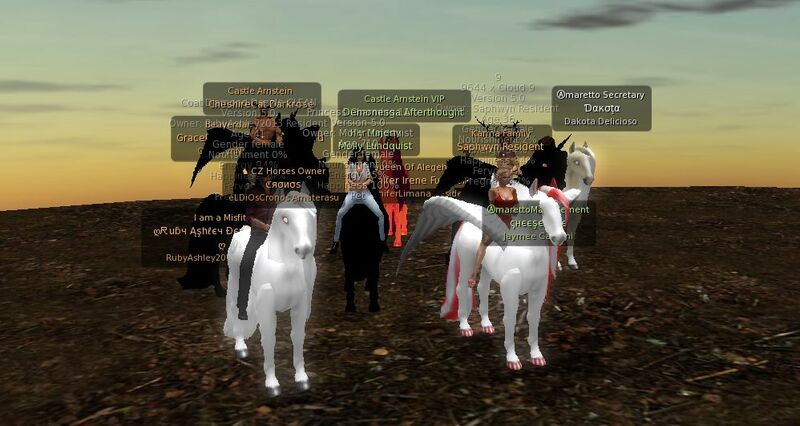 Amaretto has events for the community which are always fun and game event was no different! We played a few games of Greedy which seems to be a favorite during the game events. 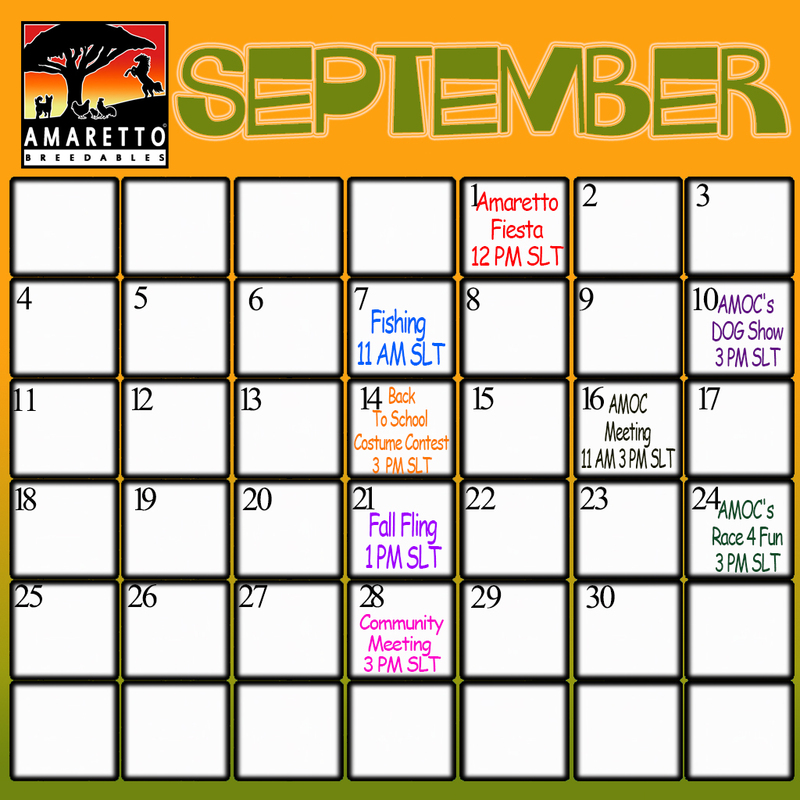 We really enjoy doing these events for the community so be sure to check Amaretto Calendars for the monthly events! Here is the URL for the Amaretto Event Calendar. Looking forward to seeing you all at the Amaretto Events! !